REDDING, Calif. - For three semesters, Simpson University students have partnered with third-graders at Juniper School for some old-fashioned pen-pal letter-writing. The collaboration between Dr. Mardy Philippian’s English students and the elementary-school students is part of Juniper’s “No Excuses University” initiative, a national program that seeks to prepare students for college. This spring, 19 students and teacher Paula Venegas, who is filling in for third-grade teacher Karen Lawrence, visited Simpson’s campus for a tour and a chance to meet and have lunch with their grown-up pen pals. AJ Valles, an English for Teachers major who transferred to Simpson as a junior, exchanged letters with 8-year-old Heaven Crosman. The two wrote a lot about space and the planets, one of Heaven’s favorite topics. Venegas said her third-graders couldn’t wait to visit campus. In addition to lunch with their pen pals, they toured the campus and were given a quick lesson on DNA in the Science and Nursing Center when a student noticed fractions on a board in Dr. Trent Smith’s classroom. The students wore Simpson University T-shirts, which they wear most Mondays at school. As part of “No Excuses University,” each class at Juniper “partners” with a college. Many of the teachers link up with their alma mater, including Lawrence, who earned her bachelor’s degree and teaching credential from Simpson University. Teachers spend time talking about various aspects of college life with their students and doing activities, such as online virtual college tours. A couple of years ago, Lawrence proposed a pen pal partnership with Dr. Philippian, whose sons attend Juniper. Philippian said the handwritten correspondence provides an opportunity for his students to connect with something lost in an era of digital communication. It has also been valuable for students pursuing teaching careers, as it gives them a closer connection to young learners, he said. Top: Simpson University students in Dr. Mardy Philippian’s English classes meet their third-grade pen pals from Juniper School outside the dining center. 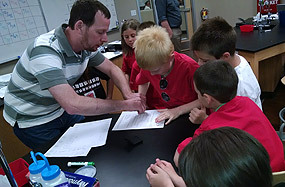 Middle Left: Biology professor Trent Smith gives a lesson on DNA to Juniper School students visiting campus.